Before the first (outward) journey it is possible to change passenger’s name and surname in the ticket for 10% surcharge, given that the rest of data (journey, final destination, route and tariff category) are applicable to the new passenger. This service is available only in ECOLINES representative offices or at stewardess. In case of changing passenger's name in ticket and/or surname all collected bonus points will be lost. Tickets purchased using bonus program (50% or 100%) are non-refundable and name and/or surname cannot be changed. For journeys of ECOLINES carriers (except the Carrier „ Ukrainskie Linii”) before the first (outward) journey it is possible to change destination and departure points within one route. This service is available only in ECOLINES representative offices (except Ukraine). If the new journey costs more, Passenger must pay the difference, however if the new journey costs less – the Carrier does not pay back the difference. Lost tickets can be reissued in the agency where it was purchased in accordance with the regulations of that agency. It is not possible to reissue unregistered tickets with „OPEN DATE”. Reissued tickets cannot be nullified, thus no refund for unused journey can be obtained; the date of departure cannot be changed. 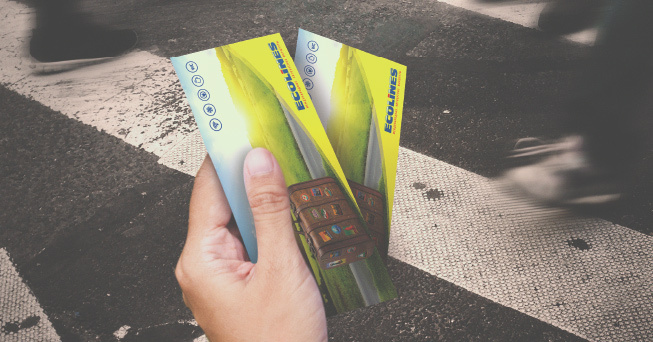 If the passenger has ticket number and security code, ticket can be printed free of charge from ECOLINES website www.ecolines.net. If the person has not the option to print, then boarding card can be obtained from the stewardess, the driver or any career’s representative (except for trips by Carrier „ Ukrainskie Linii”), or in ECOLINES offices (except Ukraine). To change the date and time of departure is possible no later than 24 hours before the departure. It is possible in any agency which sells ECOLINES tickets or on the web site www.ecolines.net. ECOLINES representative offices render this service free of charge, but other agencies can apply additional commission in accordance with the regulations of that agency. Changing date by phone call no complaints about mistakenly registered data are accepted.